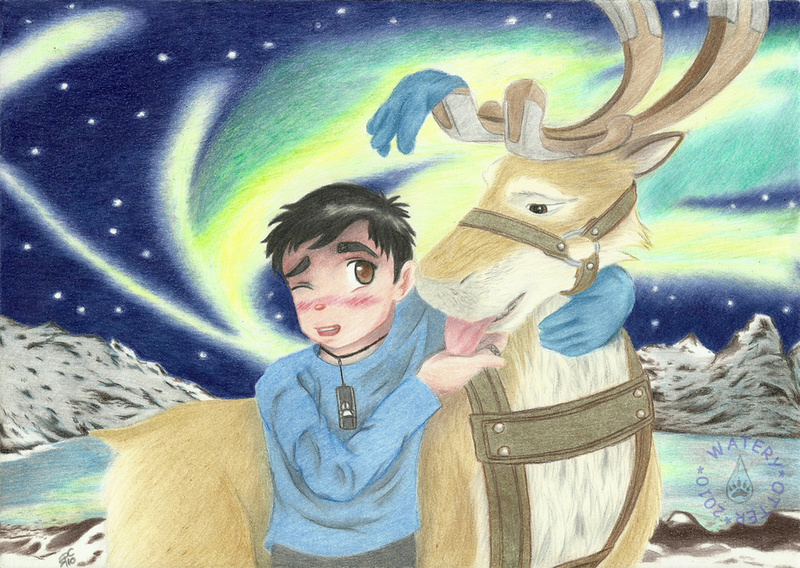 Its me in an japanese manga version, with a reindeer very familiar. 'Blitzen', he's one of the reindeer pulling Santa Clous trill, but specifically is none other than the Nico's father, about the film "Nico, way to the stars". I love the reindeers, and when I saw this movie I fell in love almost all of them and especially 'Blitzen' as a reindeer with his eyes, his greatness, with a coat so cute, and with that voice as male make my eyes begin to shine as every time as I looked. I also put the effect of the aurora borealis, to indicate that we're somewhere in the Arctic Circle. I love the mountain landscapes and the aurora borealis, so i have not known it before I started to have a great interest in visiting 'Alaska' and 'Canada'. The thing that I've been hanging around my neck is a USB flash drive with a paw that I stack cutting a sticker, which one I have saved lots of illustrations and comics furries that I found on various websites. And on my hand, on the index finger a silver ring that I use in real life. This drawing is newer for now and I did it in the last months of the last year 2010.